There are benefits to using Aliasing, but industry expert Martin Fowler warns of the potential for unexpected situations to occur when objects are not immutable. 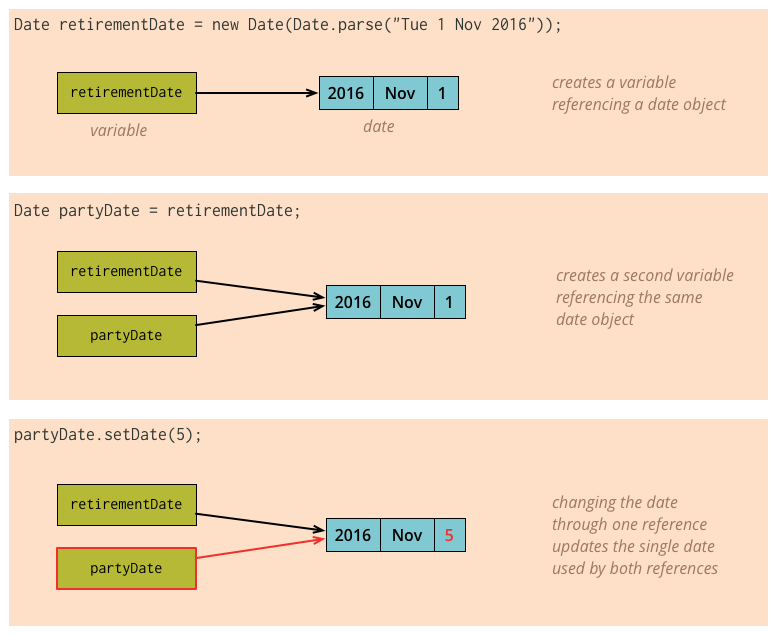 What's happening here is that when we do the assignment, the partyDate variable is assigned a reference to the same object that the retirement data refers to. If I then alter the internals of that object (with setDate) then both variables are updated, since they refer to the same thing. Although Aliasing is a problem in that example, in other contexts it's what I expect. It's common to want to share records like this, and then if it changes, it changes for all references. This is why it's useful to think of reference objects, which we deliberately share, and Value Objects that we don't want this kind of shared update behavior. A good way to avoid shared updates of value objects is to make value objects immutable. Functional languages, of course, prefer everything to be immutable. So if we want changes to be shared, we need to handle that as the exception rather than the rule. Immutability is a handy property, one that makes it harder to create several kinds of bugs. However, when things do need to change, immutability can introduce complexity, so it's by no means a free breakfast.